Yau Ma Tei Typhoon Shelter (Chinese: 油麻地避風塘) is a typhoon shelter located near Yau Ma Tei, Kowloon, Hong Kong. The Government of Hong Kong planned for the construction of a second typhoon shelter after Causeway Bay Typhoon Shelter in late 1906. In 1908 the Works Department decided to construct the typhoon shelter at Yau Ma Tei. Works on the typhoon shelter lasted from 1910 to 1915. The cost was HK$2.21 million. The typhoon shelter was officially opened by Sir Francis Henry May, then Governor of Hong Kong, on 16 December 1915. The Yau Ma Tei Boat People settled in the shelter from around 1916 to 1990. 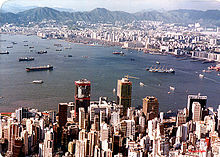 The West Kowloon Reclamation Project began in 1990 as part of the Airport Core Programme, which required a replacement for the original typhoon shelter. The new typhoon shelter was built to the west of the original one, and was completed in 1992. Housing estates built on the reclaimed land of the initial typhoon shelter include: Park Avenue, Charming Garden and Hoi Fu Court. ^ Ho Pui-yin (2004). Challenges for an Evolving City - 160 Years of Port and Land Development in Hong Kong. The Commercial Press. ISBN 962-07-6336-X. Wikimedia Commons has media related to Yau Ma Tei Typhoon Shelter. Wikimedia Commons has media related to New Yau Ma Tei Typhoon Shelter. Lack, A.J.S. (1973). "The Yaumatei Typhoon Shelter, HK 1900-1915" (the debate over its construction)" (PDF). Journal of the Royal Asiatic Society Hong Kong Branch. Vol. 13. Hong Kong. pp. 28–40. This article about or related to tropical cyclones is a stub. You can help Wikipedia by expanding it.